For H1N1 Updates, click here. The Aboriginal homeland which surrounds the present reserve site of the Kingfisher Lake First Nation has ways been utilized and carefully preserved by local first nations people as their personal heritage. The rights to culture, fishing, gathering, hunting, language and trapping were granted to the first nations people by the great creator. Thus, as the original stewards of the lands in which their ancestors lived, the current residents treat this responsibility with great care and respect. In 1808 the Hudson's Bay Company established an outpost at Big Beaver House, which is located approximentely 12 kilometres southwest of the present Kingfisher Lake reserve. Big Beaver House was frequented by Kingfisher Lake people for trading fur, community activity and freight hauling employment. 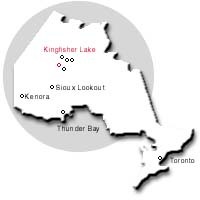 Kingfisher Lake is situated within the Sioux Lookout administrative district. The current population figurs of the first nation is 411 residents. The predominant travel mode to this community is through air transportation, however, on seasonal basis one can access this reserve using winter trails, winter road and waterwys. Kingfisher Lake can not be accessed through provincial highway, nor is there any roads connections with nerby reserve. Kingfisher Lake is surrounded by large variety of wildlife, aquatic life, vegetation and certain mineral deposits. These natural resources have benefited the first nation people both personally and commercially. At the moment there is no major development of any mineral deposits in the area. The local weather is generally affected by the air masses and eather systems that originate over the large land mass to the west, north, and south. Mean temperatures are -25c to -20c (winter) and 11c to 18c (summer).